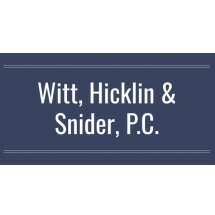 Founded in 1963, Witt, Hicklin & Snider, P.C. offers a general law practice for clients in Platte County and the surrounding communities. We are pleased to assist business owners, developers, local governments and individuals. With more than 45 years of combined experience, our attorneys bring to each case considerable knowledge and expertise. Our areas of practice include family law, estate planning and probate, business law, civil litigation, banking law, creditor collections, local government law, traffic and criminal defense, contract negotiations, real estate transactions, mediation, arbitration and personal injury. Our goal is to be your law firm of choice for life. We work diligently to create lasting client relationships that are built on a foundation of trusted service, sound advice and vigorous advocacy. We pride ourselves on our strong record of results and our superior client service. A key part of our service excellence comes from our dedicated administrative and paralegal support staff, which has more than 90 years of combined experience. Our attorneys work closely with clients to provide the highly personalized, accessible and responsive representation they require. You can rely on us for the quality legal representation you require. We look forward to hearing from you about your legal needs. Call 816-858-2750 to contact our law office in Platte City, Missouri.